I'm glad I now have a colour card to whip out and check off whenever I get bingoed. Nice one. Pretty much sums it up. Boy these quintuplet people are real geniuses eh? Spending who knows how much money to create 5 new artificial weakling babies hooked to tubes when they don't have the means to care for them all and they already had one kid. Yay! What an AMAZING MIRACLE! God clearly did it! Adopting already existing kids in need of help just wasn't going to cut it huh? What fabulous Christians. And their church is congratulating their wonderful choice by raising money to build them a new house! Go donate money here! "Few Answering Quintuplets' Needy Cries"
I've heard at least half of those from my own mother. If I get a full card, do I win a toaster? I home school my 12 children and the Lord has blessed us. 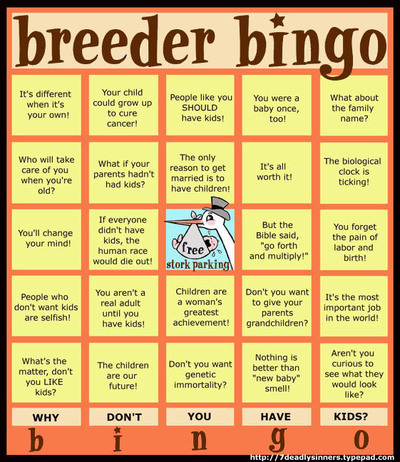 You have a FEW reasons for not having children, but here are 101 reasons for having children, o ye barren heathen! Thank You, Christian Brood Marm! Speak the Truth, Sister! 101 reasons indeed! My personal favorite is #5: "It's an honor for the Lord to use my womb again." These poor angry folks must be jealous because they have never known the joys of having the Lord move betwixt their wombs. Yikes. What a scary pink mess. I especially like numbers 14, 15, 29, 80, 92, 93, 95. Totally selfless reasons for having babies. Yup. Sure we know the joy of the Lord. He just uses condoms with us. Holy crap! This stuff is weirding me out. I'll add my little two cents: if women are suppose to be in touch with their bodies and are put here by God to create new life, then you would think that women would also be in touch with where it all comes from - Mother Nature. If Mother Nature is suffering because we are over-populating, then what do you think will eventually happen? She'll have an abortion. I think the Earth's abortion has already begun. That professor speaks the truth. Yep, the Earth is about to shake a whole bunch of us off like fleas. Hey, is that an asteroid I see? Waaahoooooooo!! !